The Decisive Moment, the first monograph of photographs by Henri Cartier-Bresson, is possibly the most iconic book in the entire history of photography. It was published in simultaneous French and English editions (the French version titled Images A La Sauvette) in 1952, and became highly collectable as it was never reprinted. The 126 photographs from The Decisive Moment have subsequently appeared in various Cartier-Bresson books, notably The Man, The Image, & The World (2003), though The Decisive Moment remains essential due to the quality and size of its images. The photographs were printed using the heliogravure process, and most were either full-page or double-page reproductions. 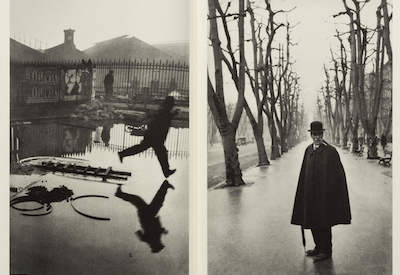 Cartier-Bresson's preface to The Decisive Moment has been reprinted in the anthologies Photographers On Photography (Nathan Lyons, 1966) and Photography In Print (Vicki Goldberg, 1971). It was also included, with a new post script, in an issue of Les Cahiers De La Photographie devoted to Cartier-Bresson (#18, 1986). Cartier-Bresson included it in his own anthology of his writings, L'Imaginaire d'Apres Nature (1996), published in English as The Mind's Eye (1999). Cartier-Bresson was most often associated with photojournalism, though he was arguably the greatest of all photographers. His 'decisive moment' concept is probably best encapsulated by his most famous picture, Derriere La Gare St Lazare, a photograph of a man jumping into a puddle. He died in 2004. 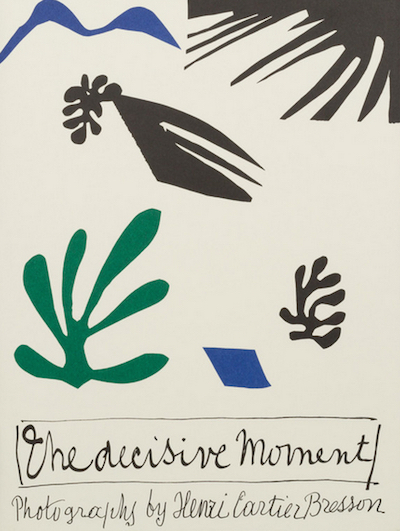 More than sixty years after its original release, a facsimile edition of The Decisive Moment has finally been published. It's available in a slipcase, accompanied by a fascinating booklet written by Clement Cheroux (author of this year's Henri Cartier-Bresson: Here & Now) titled A Bible For Photographers. The reprint is a full-sized reproduction of the original folio, with the same jacket designed by Henri Matisse, though not the supplementary twelve-page Captions booklet (on which the Cheroux booklet's design is based). Curiously, some of the blemishes in the original images have been removed in the new edition (for example, in print 105).